At Elysian Auto Service, we love them all! We don't care if you drive a Chevrolet, Cadillac, Chrysler, Ford, Dodge, Honda, Pontiac, Saturn, Toyota, Foreign or Domestic - we can handle your needs. Our expert staff is equipped with the tools, training and information to help maintain or repair your car. From an oil change to computer diagnostics, Elysian Auto Service has your back. We will help you through the process like you're part of our family. We offer a early bird/after hours key drop for your convenience - 24 HOURS A DAY, SEVEN DAYS A WEEK. Park in one of the spots in back of Elysian Auto Service. Completely fill out the envelope (located beside back door) and give us several phone numbers to be able to contact you. Also, please list all of your problems/noises/smells with your vehicle and when it was last serviced. Make sure to sign the envelope. Put your alarm remote and your CAR KEYS ONLY in the envelope. Place the completed envelope with your car keys in the back door slot labeled AFTER HOURS KEY DROP. If you do not have an appointment, we'll call you first thing with a schedule of your service or repair. If you do have an appointment, we will call you as soon as your vehicle is diagnosed with an estimate for the repairs. To assist drivers with getting their car into the shop for quick service, Elysian Auto Service provides free pickup and delivery service. 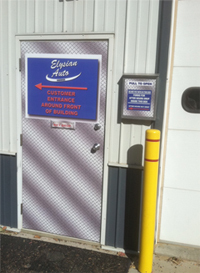 Customers who cannot get their car or truck into the shop need only schedule a time for an Elysian Auto Service employee to pick up their car or truck. Then, once the repairs are completed, an employee will drop the car off to the customer. This process has saved countless satisfied customers' precious and valuable time. Customers can devote their time and attention to their already busy lives, and leave the transportation of their vehicle to a trusted Elysian Auto Service employee. You can drop off your vehicle and continue on with your busy day and stop after work to pick up your completed vehicle, hassle free! We start every visit with a full 42 Point Digital Inspection. 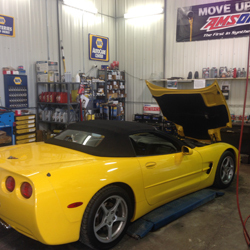 We go over the entire vehicle from exterior to exhaust, checking all safety and maintenance needs. See your vehicle through the eyes of our expert mechanics when we text, Email or print an interactive report with your vehicle's health straight to your phone, computer, or mobile device! Scroll through our comprehensive 42 point digital inspection right at your finger tips at work or home. Your vehicle's health report is complete with photos, video, notes and a rating system that helps you know what is Green - Good Passed, Yellow - Non Urgent and Red - Urgent. With our 42 point digital inspection, you can make an educated decision about repairing and maintaining your vehicle. Our 42 digital inspections are stored in our database, making it easy to track the wear of standard maintenance items and allows us to predict what your vehicle will need in the near future. The ability to monitor your vehicle's health report makes our 42 point digital inspections an invaluable part of the service we provide. After reviewing the 42 point digital inspection, give us a call, text or email and we will give you a fully itemized estimate on the repairs and maintenance we recommend. 42 Point Inspections are free with any service! No Surprise - All work is approved by customer before any work is done. ASE (The National Institute for Automotive Service Excellence) give you the confidence you deserve when selecting who services your vehicle. In Minnesota you have to be licensed to unclog a drain or cut someone's hair, but not to work on an automobile. ASE gives you the confidence you deserve when selecting who services your vehicle. At Elysian Auto Service, you never have to worry because all of our technicians are certified by ASE, and all of them are ASE certified Master Technicians. This voluntary accreditation is just another way we display our dedication to our industry and our customers.